Members of our Patient Safety Collaborative were at Patient First in London this week, the UK’s largest patient safety event, to showcase and share learning from some of the initiatives we’ve been developing in the West of England. 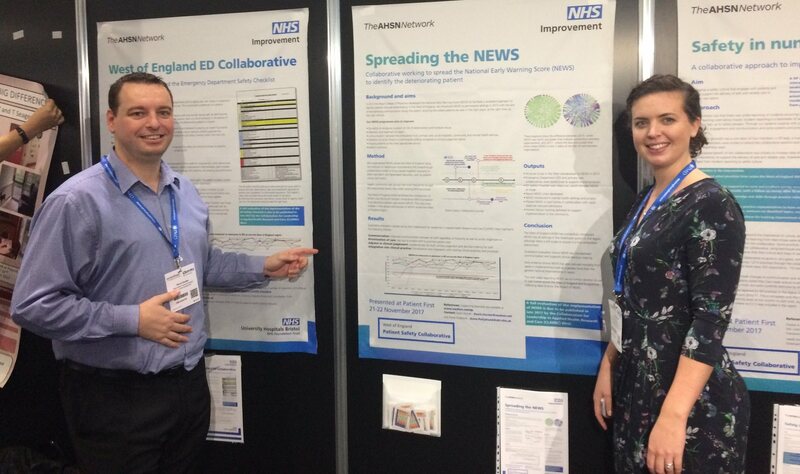 We presented three posters at the event on: our work to implement the National Early Warning Score (NEWS) across all healthcare providers in the West; our programme of support to spread the ED Safety Checklist across all emergency departments and the ambulance service; and our collaborative approach to improving safety culture in primary care. Anne Pullyblank, Clinical Director for Patient Safety and Emma Redfern, Medical Director for Patient Safety, also presented a session in the Best Practice Theatre on the Collaborative’s achievements in delivering safer care through NEWS. These posters are available to download with supporting resources. Spreading the NEWS: collaborative working to spread the National Early Warning Score (NEWS) to identify the deteriorating patient. West of England ED Collaborative: working together to spread the ED Safety Checklist. Safety in Numbers: a collaborative approach to improving safety culture in primary care. “After some difficulties with the trains and underground, we finally arrived and the buzz at the venue suggested a real sense of excitement and enthusiasm for this year’s Patient First conference. “Across the two days, and as well as a dedicated Patient Safety Collaborative stand, the AHSNs were presenting their Patient Safety endeavours in the Best Practice theatre. When the time arrived, our own safer care through NEWS presentation proved as popular as ever. For more information on our Patient Safety Collaborative, please contact any member of the Patient Safety Team. Pictured in the photo are: Kevin Hunter, Patient Safety Programme Manager, and Joanna Garrett, Patient Safety Improvement Lead.